The tragic deaths of Philando Castile and Alton Sterling last week evoked cries of outrage, despair, and an urgent need for change. That's when the Express decided to give this paper over to readers, in an attempt to unite and amplify those feelings. And, despite the short notice, dozens of people sent us their words and thoughts. We are truly humbled. 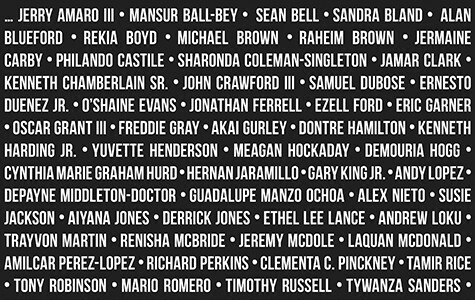 This issue's front cover features names of Black and brown victims in the last decade. 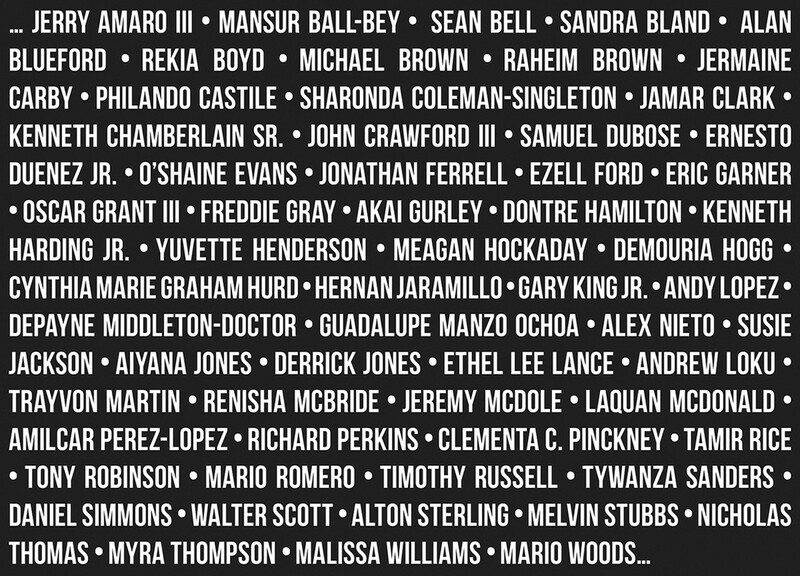 But the following words speak to this country's legacy of prejudice and injustice toward Black men, women, and children ­— that must end now. Black faces, weeping mothers and screaming babies. Another loss of a father, son, friend. The Black Man. Time and time again. The same headline. A different place, different face, but always the same race. We have more to offer this world and other spaces to fill ... outside of your cuffs and coffins. For the past few days, I have struggled getting out of bed. I didn't have much trouble when one of my favorite singers, Christina Grimmie, was shot and killed. I laid still after the shooting in Orlando, not crying loud so as not to disturb my family. But after these recent police shootings targeted toward Black men, I have started having scary thoughts: "I don't want to do this. I can't do this. I don't want to do this anymore." The pain is so, so immense. Truthfully: I want to forget. Growing up in Oakland, I've been aware of gun violence from a young age. I detached myself from the disturbing feeling it brought. Then, my brother's friends started dying. My friend's friends started dying. I was suddenly aware that I was not safe. I am not safe as a person living in Oakland, not as a Black person, not as a queer person. Not around police. I can't describe to you the feeling that came onto me upon realizing that, for my entire life, I have never been safe. Maybe I already knew. I think I did. But for the first time, I've been forced to look at the facts straight in the eye. All of that truth, it stared at me deep and said, "I've got you." And it's been hard for me to breathe ever since. I shared my worries about thoughts on not wanting to do "this" on my Facebook page. People started commenting that it was normal, that they felt the same. And maybe it is normal. But it isn't right, and I can't brush it off. It felt strange to know that so many of my non-Black friends were going to protests and vigils while I preferred to stay at home. I am Black — does that mean I can take all of this pain? The answer is no. I will never go to a protest. I cannot go to a vigil. I know myself well enough to know I am not emotionally capable of handling it. But I understand the pain. The last time I was too depressed to get out of bed was a year ago, in the lowest point of my life. Not everyone has experienced this before. I want to say to all the people who are finding themselves steeped in despair: It is OK if you do not want to go out and fight. It is OK if you don't want to turn to social media. Even the greatest soldiers have to rest after war. "Why did they kill him?" "Did they kill him because he was wearing a red shirt?" Those were the words coming from my four-year old Black son as we watched television and together witnessed the brutality and killing of Alton Sterling by Baton Rouge police officers. So, in my four-year-old's mind, the only connection he could make for what he was seeing was that a man was killed because he wore a red shirt, and it was wrong for police officers to take his life. What I didn't tell my son is that Alton was killed not because his shirt was red, but because his skin was black, his gender was male, and that, one day, he will be looked upon the same way: a threat because he is breathing and Black. I know enough to know that my son's threat index is rising by the year. My son and I have robust conversations about everything from Curious George and Fireman Sam to Hillary Clinton and Donald Trump. But I'm also beginning to incorporate race and social justice into our conversations, which he tries to understand but doesn't yet. Will my son sell DVDs and CDs outside of a store and have the police called on him? Will he be driving in a car with his girlfriend, like Philando Castile, and be pulled over by police — and within minutes be shot to death in the front seat? To all these things I say: I don't know. I can't predict every experience in his future, I can only prepare him for it. I strive for him to be well-educated, kind, strong, confident, and enlightened. But none of these things are a shield against racism, implicit bias and oppression. What we must realize is that these instances of police interactions with Black men, boys, women and girls is not new. What is new is the technology to record it, and social media to instantly live-stream, tweet and post. These images provide us a window for what many in the Black community have experienced for centuries, but with it now captured for all of us to see, the trauma and the pain is that much deeper. We must recognize that we have all witnessed the final seconds and ending of life: blood seeping out of their bodies, arms and legs twitching, painful moaning and finally their last breath.